FPA Press Realease: Scottsdale, Arizona – The Flexible Packaging Association (FPA) has announced the winners of its 63rd Annual Flexible Packaging Achievement Awards Competition. 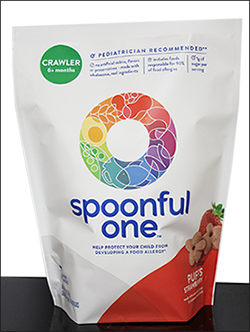 CL&D Graphics, Inc. of Oconomowoc, Wisconsin, received Silver — Printing and Shelf Impact for the Before Brands SpoonfulOne Strawberry Puffs Gusset Pouches. Before Brands SpoonfulOne Strawberry Puffs Gusset Pouches are an excellent example of how converting to flexible packaging creates exceptional brand management. The new, improved packaging creates a colorful, exciting gusset pouch with bold colors and a matte finish to emphasize the many features of their product. Before Brands SpoonfulOne Strawberry Puffs is a gusset pouch that contains seven snack packs. List of nutrients that are required or permitted to be declared. Provides updated Daily Reference Values and Reference Daily Intake Values that are based on current dietary recommendations. Amends requirements for foods represented or purported to be specifically for children under the age of 4 years and pregnant and lactating women and establishes nutrient reference values specifically for these population subgroups. 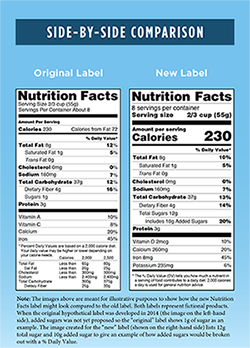 Revises the format and appearance of the Nutrition Facts label. 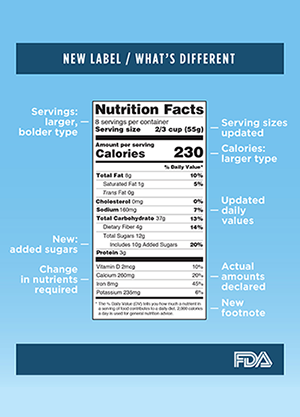 UPDATE: The FDA extended the compliance dates for the Nutrition Facts and Supplement Facts label final rule and the Serving Size final rule, from July 26, 2018 to January 1, 2020, for manufacturers with $10 million or more in annual food sales. Manufacturers with less than $10 million in annual food sales would receive an extra year to comply – until January 1, 2021. Please refer to the FDA website for regulation updates. May is a busy volunteering month for our associates! We hosted our 3rd Blood Drive at our Hartland, WI Division. 32 Donors (4 First-Time Donors) - 84 patients helped. We also participated in the Annual LakeWalk for Cancer in Oconomowoc, WI. Thank you CL&D Team! Sustainability is important to CL&D and many of our customers! CL&D recently visited the Keep Greater Milwaukee Beautiful Recycle Center in downtown Milwaukee. The team toured the Milwaukee Materials Recovery Facility to support our research initiatives and learn the many ways plastic, glass and aluminum is sorted, bailed and resold back into the market. Flexible Packaging is the solution for sustainable brand management. Today consumers are focusing on convenience and social responsibility. CL&D offers recyclable flexible packaging and floatable shrink sleeves. Visit our Sustainability page to learn more about converting from rigid to flexible packaging. PRINTING EXCELLENCE IN THE TRI-STATE REGION RECOGNIZED CL&D GRAPHICS, INC.
MARCH 2017: The Great Lakes Graphics Association (GLGA) has announced that CL&D Graphics is an award winner in the 2017 Graphics Excellence Awards (GEA) competition. The GEA competition is one of the largest printing competitions in the nation. 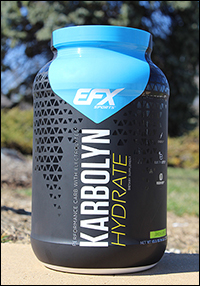 CL&D Graphics, Inc. achieved an Award of Excellence in the Flexo Narrow Web Labels and Wraps, Rolled Products/Pressure Sensitive Category for the EFX Sports Karbolyn Matte/Gloss Shrink Sleeve. A panel of out-of-state judges with extensive experience in printing and print production examined the work and each entry was judged on its own merit in a category with similar printed pieces. The judging criteria included registration, crossovers, clarity and neatness, sharpness of halftones and line drawings, richness and tonal qualities of color, paper and ink selection, ink coverage, difficulty of printing, effective contrast or softness, finishing, bindery and overall visual impact.